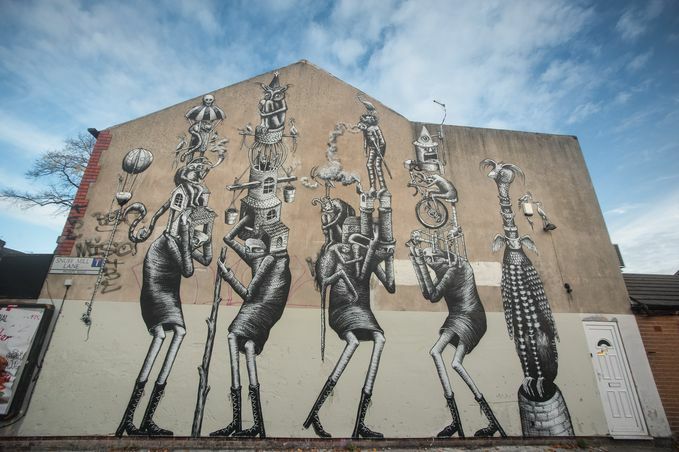 Street art on Snuff Mill Lane by Phlegm. Photo by Chris Saunders. Soak up the sun in Sheffield this week and enjoy Spider-Man, salsa and Sheffield Bricktropolis, as well as some stellar comedy and discussions in #SheffAfter5. Read on to see how you can join in on some of the Steel City’s action. True to form, the first Wednesday of August hits this week, and The Leadmill has a stellar line-up ready to get you laughing all the way to the weekend. Let Jeff Innocent, Susan Murray (Compere), Mo Omar, and Josh Jones do the talking while you sit back and relax, perhaps even with a plate of Mexican food from Street Food Chef. Tickets (including discounted student tickets and table tickets for up to 4 people) are available here. Hallam Union is screening the latest Spider-Man film, ‘Spider- Man: Homecoming’ for free this Wednesday from 6:15pm. Watch Peter Parker attempt to balance high school life with being Spider-Man, while also facing the Vulture, sat in the comfort of the sofas, bean bags or deckchairs at Hallam Union. Open to everyone, including non-students, there’ll also be free popcorn and refreshments. Dance the night away at Revolucion de Cuba this Thursday at it’s weekly salsa social, where all levels of ability are welcome to come and feel the rhythm of the live band and DJ from 7pm. Why not get a taste of Cuba beforehand and enjoy three tapas dishes for £10 (simply quote ‘Dine & Discover’ when ordering)? The Latin-inspired cocktail bar and restaurant is our chosen restaurant for Dine & Discover this month. It’s also hosting an exclusive Dine & Discover rum tasting evening on 6 August. Find out more here. From 4-17 August, Sheffield will become a city of LEGO® bricks as Sheffield Business Improvement District (BID) brings Sheffield Bricktropolis to the city centre. With a Brick Architecture trail, free interactive LEGO workshops as well as various fringe events, including a LEGO mosaic build at City Hall, the Outdoor City will be buzzing with activity and a collective love of LEGO. Find out more and stay in the loop about this by using #SheffieldBricktropolis. You can also sign up for email updates at www.sheffieldbricktropolis.com.